The name is about how old, dead information is reanimated, and comes after you to eat your brain. The store side is “Zombies of the Information Society” to describe some of the products I sell, which are old paper. The blogging and seller side is “declutter69” which is about dealing with clutter, this blog, some of the stuff on Pinterest, the decluttering book, and so on. Obviously, these two things are related, but I think the store name is cooler, and also doesn’t necessarily harm the image of the products being sold. I always thought “declutter69” could discourage sales. Now, I can put up an ecommerce store to sell items, in parallel with Ebay, but also things that just aren’t selling on Ebay because they’re too obscure. These are mostly books and ephemera, or “zombies” from the old information society. The term “the information society” is from the 1960s. In the mid 1980s, a new wave dance band called “The Information Society” had a hit with “I Want to Know”. Typical 1980s. When this song it it big in 1988, it wasn’t innovative or even “new” sounding. It sounded like a sing-song pop rehash of a lot of English New Wave bands like Duran Duran, Depeche Mode, and Kajagoogoo, which were like pop takes on “real” New Wave like Gary Numan, Vince Clarke, or Giorgio Moroder. Even Kraftwerk was consider “old” by 1988. They were. Honestly, it sounds a lot better to me today than it did back then – they did some nice electro. I’ll say the same for post-Clarke Depeche Mode, which is much better. Even the name, “Information Society”, sounded kind of lame. It had been in use since the 1960s, and the closest reference I’ve seen to an “origin story” is Daniel Bell’s The Coming Post-Industrial Society, published in 1976. 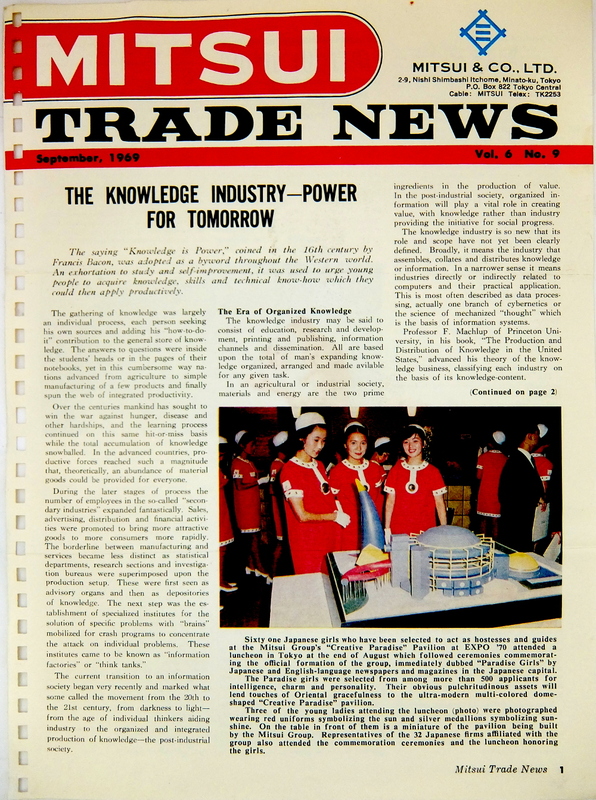 This article, from 1969, also describes the “era of organized knowledge” and “the knowledge industry”, and uses the phrase “information society”. This is a trade magazine, not a sociology or computer journal. Just look at the photo to see how backward and sexist this “future” was going to be. Yeah… nothing so edgy like naming your band in the 1980s after a term from the 1960s. The name “information society” reeks of immediate obsolescence, as new information displaces current information, and the idea of a “future” is reimagined faster and faster. What I want to evoke with “Zombies of the Information Society” (zInfoSoc) is the way that old images and words come back to evoke memories, or to construct an imagined past, and displace current information. Information competes with other information for space in the brain. It’s not that different from “declutter69”, in that both deal with remembering and forgetting. declutter69 is about competition for limited space outside the body. zInfoSoc is about competition within the body and brain.